Thank you for visiting my internet site. I have been collecting for over 40 years. My main interest is in German WW2 Military relics. On this site at the left you will find links to my items. The "Store" tab on the left will take you to my online store or click here: Ron's German WW2 Military Bunker. You can purchase with your PayPal account or with your credit card through PayPal. You don't even need an account with PayPal. And there's no PayPal signup required - just pay with your credit card. Payment can also be submitted via postal mail by check or money order. After you have created an account, you can purchase items by adding them to your shopping cart. When checking out, you can choose your payment method. Pay by PayPal and select "PayPal Credit" to enjoy no payments and no interest if paid in full in 6 months on PayPal Credit purchases of $99 or more. Click on banner below for details. The "eBay Military" tab will take you to my military items on eBay as shown in my "Ron's Things" eBay store. The purchases there will be handled through my eBay account. The "eBay Store" tab will take you to my eBay "Ron's Things" store showing all of my items military and non-military. The purchases there will be handled through my eBay account. I offer only original, genuine, authentic German WW2 era collectibles. I do not sell reproductions, fakes or copies. All items are guaranteed to be absolutely authentic. I will be updating and adding new items periodically, so please keep checking back. Please email if you have any questions. You can contact me through the "Contact Us" email link located in the store or directly at my e-mail address: rsg@ronsthings.com - I am looking forward to hearing from you. 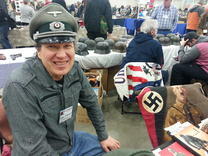 Thanks again for your interest in German WW2 vintage military collectibles.